Express your love for Star Wars this Halloween by becoming its most famous villain! Purchase the Adult Darth Vader Costume from Buy Costumes and impress all the Star Wars fans in your town. 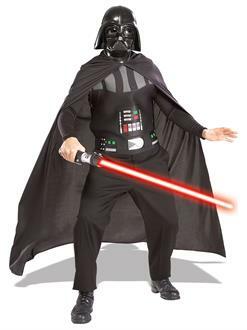 This officially licensed four-part outfit features a black Vader mask, a flowing black cape, a Vader chest piece, and an evil red light saber. Wear black pants, shoes, and gloves to complete this villainous look. All accessories are sold separately. May the Force Be With You!